Let’s suppose that from the very beginning, as we learned to write, we’d been given a way in which to typographically mark our opinions, statements, and messages with the kinds of additional meanings that are conveyed instantly when speaking face to face. If that had been the case, then dedicated symbols for the semantic qualities that characterize our communication — such as irony, optimism, seduction, skepticism, authority, etc.—would be just as commonsensical and integral to the way we write as it is to use exclamation points or quotation marks. Point to a symbol to find out its meaning. A combination of casual everyday observations and deliberately paying attention to things has provided us with the present—incomplete—list of terms for feelings that govern and set the tone of direct spoken communication. Typojis, just like other character sets, adhere to certain parameters: ascender height, x-height, the baseline, and descender height. Bring more clarity to your written communication! Avoid misunderstandings by letting undertones and shades of meaning resound in the mind’s ear. These new symbols step up to combat the misinterpretation of what you write—and open up new worlds for your words. Typojis. Einige neue Zeichen / A Few More Glyphs. 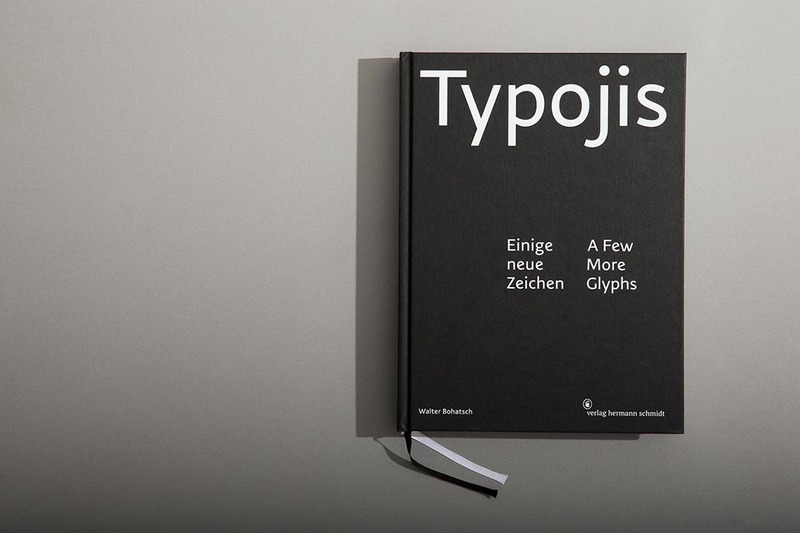 The book illustrates the typojis’ semantic meanings by juxtaposing them with symbolic photographs, and subsequent initial glimpses into how typojis are actually used come in the form of personal contributions by 49 individuals who hail from a wide range disciplines. Each such entry also includes exercise pages that invite you to try writing these new characters for the first time—making your copy a unique exemplar. With texts by Walter Bohatsch, Gabriele Reiterer, and Ernst Strouhal. Point to a term to see the corresponding Typoji. The Typoji font includes over 400 glyphs, enabling it to support Central and Western European languages. The typojis themselves can be accessed via the ligature feature in your word processing or design software. So if you type +optimism+ with ligatures turned on, your software will insert the typoji for optimism. Would you like to use the typojis in other fonts, as well? If so, please contact us – we’ll be happy to work with you to develop a solution. All Typojis are fully protected throughout the EU in accordance with current EU Community Design legislation.